Brussels is set to follow the U.S and push back the start of vital global bank reforms. While not ideal, a delay of months rather than years would be bearable. 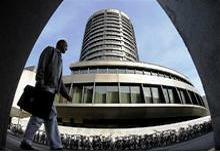 The danger is that Basel III haters and self-serving banks use the confusion to water down what remain worthy reforms. A man walks past the headquarters of the Bank for International Settlements (BIS) in Basel September 14, 2010. The implementation of Basel III rules on bank capital will push up borrowing costs for Asian companies, loan bankers have warned. The introduction of stricter capital rules for banks will go ahead as planned on Jan. 1, the head of the Basel Committee at the Bank of International Settlements told Reuters on Nov. 27. EU sources told Reuters earlier that Europe is preparing to follow the United States in delaying the introduction of stricter rules on bank capital, while it lobbies for a rethink of the U.S. stance, EU sources said.